I had actually wanted to read this back when it was big, but never did. Anyway, we had it sitting on the shelf, and it came to mind when I was trying to think of something easy (but not too easy) to read to help me out of the reading slump I've been in. Turned out to be a pretty good book for it, actually. It's a memoir, which I'm discovering (against everything I'd ever suspected) to be a genre I'm really drawn to. And it has an engaging—though not overly serious—tone throughout. 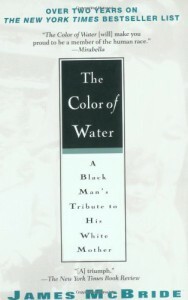 The subtitle of the book is "A Black Man's Tribute to His White Mother." James McBride is—sure enough—a black man who grew up with what he assumed to be a WASP mother. Which, growing up in Harlem during the Civil Rights era, would be drama enough. But then as an adult he gradually came to realize that his mother was actually a Polish-born Jewish woman. She had shed her Judaism, and an entire life along with it, many years before he was born. This book essentially tells the story of his quest to learn about that abandoned life, and along the way it's a fairly typical memoir of growing up. Or rather, it's two of them—in alternating chapters, he intertwines his own story with that of his mother. Still, even if they are typical, these two stories are not uninteresting. McBride has a somewhat unique take on the racial tensions & struggles that surrounded him as he came of age. And his mother's story is both heartbreaking and triumphant, though one can imagine it being better told. There's a lot to think about here, though I'm sure the story is even more complex than this telling of it. Still, worth reading.